I’ve decided that 2011 will be the year I finally move my gardening habit into the cooler weather seasons. I’ve gotten a start from a row of Swiss Chard that was planted in the spring of last year. I noticed at the tail end of February that these plants were still setting new growth, and I decided to cover the row as a way to help the plants produce earlier in the season. This is the first time I’ve used a row cover to get a jump on the season, and I’m fairly surprised at how easy it is, and how well it works. 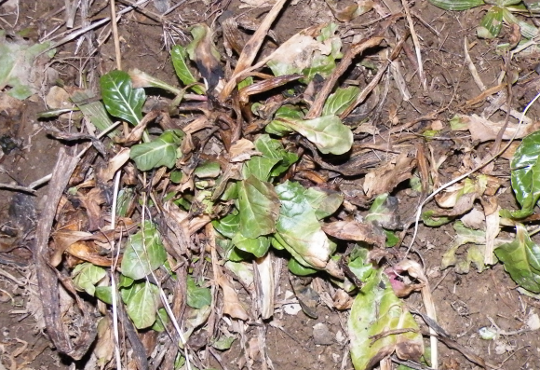 I also wanted to show the difference between the plants which have been protected, and the ones which have felt the full brunt of the late winter snow. 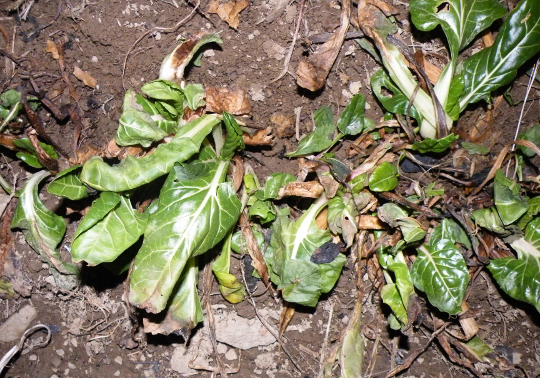 The exposed chard isn’t looking too good. Many of the leaves are wilted, and I doubt they are edible, never mind tasty. There is one small leaf in the photo which might sustain a cricket for a day, but It would be nearly useless for a human snack. Now…. To find more plastic to use as a row cover for some soon to be planted lettuce. I should also note that I’ve planted my Artichoke and Brussels Sprouts seeds on March 14th.